State Rep. Bob Siegrist discusses current issues with constituents. TRI-TOWN – Throughout the months of March and April, State Rep. Robert Siegrist (R-36th) met with taxpayers in all four towns that he represents and gave an update on the latest news from the State Capitol, including the state budget. 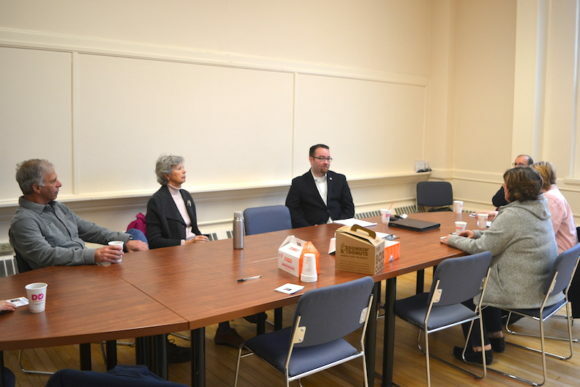 Siegrist hosted early morning coffee hour events across the 36th district, giving residents in Chester, Deep River, Essex and Haddam the opportunity to meet with their legislator and speak with him about their concerns. Siegrist stressed the importance of lowering tax burdens on families and businesses and restoring municipal funding cuts proposed in the governor’s budget. Siegrist held his coffee hour events at the following locations: Simon’s Market Place in Chester, Hally Jo’s Corner in Deep River, Jack’s Country Restaurant in Higganum and the Town Hall in Essex. “While communicating with residents in district, I vowed to always be available and more importantly, to always listen to the interests and concerns of my constituents. I’m grateful to all those who attended and especially for providing their feedback regarding state and local issues,” added Siegrist. Attendees at the legislative coffee hour events also discussed a variety of issues, including state taxes, invasive species, marijuana, education and funding for transportation infrastructure. Any resident who missed the events but would like to contact Siegrist may do so at 800-842-1423 or email Robert.Siegrist@housegop.ct.gov.